COLUMBIA COUNTY, FL – Monday's June 12, 2017, Lake Shore Hospital Authority meeting flew under the radar, however, after obtaining an audio tape of the meeting and interviews, it was not a pretty sight as the Governor's Lake Shore Hospital Authority Board, with barely any conversation, slammed Columbia County (read taxpayers) with a 76% rent increase for the offices used by the County Economic Development Department. This part of the LSHA building now houses the County Econ. Dev. Dept. The renovation was paid for by all County taxpayers; For 3 yrs it remained vacant. 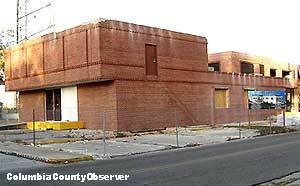 In August 2006, Columbia County offered to donate the old County Jail to the Lake Shore Hospital Authority. The Authority accepted the donation and remodeled the building, erecting a monument to itself. Upon completion of the renovation, the cost of which was never released to the public, the Authority moved from its headquarters a block away and began use of the renovated Authority Building in August 2009. Between August 2009 and February 2012, neither the LSHA Board, nor Hospital Authority Manager Berry made any attempt to rent or lease the vacant office space at the Authority's new headquarters. Built for three people with taxpayer dollars, the LSHA Hdq and the LSHA campus is unfriendly to the handicapped. During the February 13, 2012 Authority meeting, Manager Berry announced that "the Economic Development Council would move into the west end of the [LSHA] Administrative Complex by April 1st." Columbia County had no such thing as an "Economic Development Council." 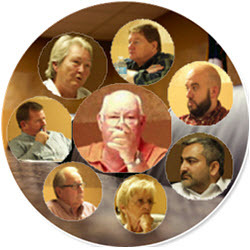 The February 13, 2012 Authority minutes put it this way: "He [Jack Berry] informed the [LSHA] Board that the Columbia County Economic Development Council would like to lease the west of the LSHA Administrative Complex on a month to month basis for $1,000.00 per month. Motion: Mr. Marc Vann made a motion to approve the lease. Mrs. Lory Chancy seconded the motion. All were in favor." On March 1, 2012, the County 5 discussed moving the County Economic Development Department from the Bank of America Building to the Lake Shore Hospital Authority Building. The 5 agreed that the lease would not be priced by the square foot, but would be same flat rate $1,000 per month that the County was then paying for its space in the old Bank of America Building, which had found another tenant. It is not clear what lease was approved that night, as neither Columbia County nor the County Economic Development Department could come up with any written lease for the space. However, on February 14, 2012, Manager Berry sent a letter to the nonexistent "Columbia County Economic Development Council" stating that the LSHA Board "approved the request for the lease." Manager Berry did not include any lease or other documentation. During the March 1, 2012, County 5 meeting it voted unanimously "to enter into a lease with Lake Shore Hospital Authority." Neither the County, nor the Authority had come up with a lease. By 2017 there was still no lease. Beginning in 2012, energy and money was beginning to be spent on the Jack Berry Highway. In 2016, Representative Liz Porter sponsored a legislative contribution for the unneeded Jack Berry Highway, known officially as the Lake Shore Bypass. Florida Tax Watch labeled the road a "Tax Watch Turkey." In 2017, the County 5 turned down the Jack Berry Highway. After some repurposing with the Florida DOT, Lake City took on the project. Manager Berry was reported to be furious at the County thumbs-down. The June 12, 2017 LSHA Board meeting had one item of new business on its agenda: "Office Rental to Columbia County"
As usual, Manager Berry provided no additional information. There were no leases and no letters to the County regarding this issue. In 2012, the board agreed to rent to the County, the office space on the west end of this building, which consists of 2385 sq. ft. The agreed-upon rent was $1000 a month, including utilities. The County is paying eight dollars a square foot for rental property out at Duval Place [a leased office space]. And I think they ought to be payin' us eight dollars a square foot. If we gonna' use one of their community centers, they're gonna' charge us $125 dollar deposit and $50 rental fee. What I propose to the Board is that we charge em' eight dollars a square foot for 2386 sq. ft. which amounts to $1590 a month. The electric bill average over 12 months is $90 per month, for a totally lease amount of $1680 per month and make it effective July 1. Mr. Adams: Any discussion? What about water? Mr. Berry: We furnish water. Mr. Adams: OK. Water and sewage. We're providin' that. Ms. Creel: Who's providing it now? Who's providing in Duval Place? Mr. Berry: They provide water and sewage. I'm pretty sure. But not electricity. Mr. Adams: What are they payin' now? Mr. Berry: A thousand. And also $75 if they wanna' use the facilities of meeting rooms. They charge us. Mr. Berry: It's month to month. Mr. Adams: Month to month. All right. Ms. Creel: We do not have a lease with them? Mr. Berry: No, we do not. Mr. Creel: Shouldn't we have one? Mr. Berry: Well - it's - its - do you want me to request a lease? We'll do that. Ms. Creel: Do we pay taxes on that? Mr. Berry: No. It's tax exempt. It's always been on a month to month since 2012. Mr. Adams: All in favor say 'aye'. (It was unanimous). On Tuesday, June 13, 2017, your reporter asked Economic Development Director Glenn Hunter if he had heard about the rent increase passed by the Authority the night before. He said no one told him about it and suggested that County Manager Ben Scott would be the person with whom to talk. On June 22, County Manager Scott told your reporter that "We gave them the building; we're looking at our options; we will most likely be out of there; it's not like we're costing them money." On June 23, your reporter put in a public record request asking for a copy of the lease between the County and the Authority. County Manager Scott responded, "I could not find a lease agreement, simply a letter explaining the rent amount." Former Authority Board member, Berry supporter, and now County Commissioner Tim Murphy did not respond to a request for comments. Former Authority Board member, Berry supporter, and County Commission candidate, Marc Vann did not respond to a request for comments. The Lake City Reporter, the County's mainstream print media, newspaper of record, and the local version of Pravda, has remained silent about the Authority rent increase to the County.